German Order Police and Blue Police at Kraków in 1941. Wikicommons/ Bundesarchiv, Bild. Some rights reserved. In January 2018, the right-wing Law and Justice government in Poland passed an amendment to the Act on the Institute of National Remembrance. The law prohibits any attribution of responsibility for Nazi atrocities, including the Holocaust, to either ‘the Polish state or the Polish nation’. Violators can face up to three years’ imprisonment for offenders, though following changes adopted in the lower house of the Polish Parliament in June, the criminal element might be removed in favour of merely civil proceedings and remedies. The prohibition is most commonly justified as a step to protect Poland’s reputation from misplaced blame for the Nazi extermination camps and to preserve the memory of the many non-Jewish Poles killed in the Holocaust. Within Poland, one often hears these justifications as part of an outcry against ‘Polish death camps’, a phrase used in, for example, a 2012 speech by Barack Obama, which many Poles take as reflecting a wider perception that Poland was responsible for the Holocaust. Whilst any serious references to ‘Polish death camps’ are demonstrably wrong, the prohibition serves to mask a much more morally complicated history of the relationship between civil society, the German occupation, and anti-Semitism in Poland. Put bluntly, the prohibition serves to reinforce the notion that no sections of either the Polish state or nation collaborated with the Nazis, or that if any Poles did collaborate, they were numerically insignificant and do not reflect the ‘true’ Poland. This dangerous simplification of history is key to understanding why the new prohibition is widely criticised as anti-Semitic. 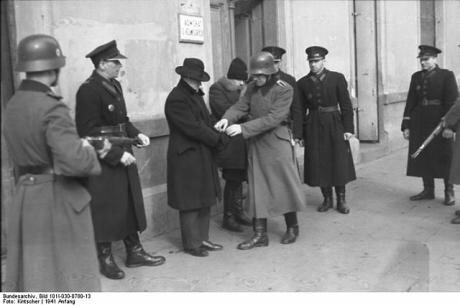 During World War II, the ‘Blue Police’ – essentially the pre-war Polish state police with German leadership – helped carry out the tasks of the Nazi administration, including such roundups of Jews as that in Działoszyce in 1942. In July 1941, at least 340 Jews were massacred in Jedwabne. As with similar pogroms in Radziłów and Stawiski that same summer, even when directed or encouraged by German occupying forces, local gentile Poles conducted much of the massacre. Anti-Semitic oppression in Poland continued after the end of the war and the establishment of Soviet rule in 1945. Most infamously, on 4 July 1946 in Kielce, where Jewish refugees were gathered, a mob killed at least 42 Jews and injured over 40. Polish troops and police officers carried out much of this violence. Decades later in 1968, General Mieczysław Moczar waged a state-sponsored ‘anti-Zionist’ campaign that led to some 20,000 Jews being expelled. These brutal manifestations of anti-Semitism during and after the Second World War occurred simultaneously with courageous acts by gentile Poles against the occupying forces and in solidarity with Jews. As well as waging partisan warfare against German forces, Polish resistance fighters often helped Jews hide and escape. For this reason, there are more Poles than any other national group in the ‘Righteous Among the Nations’, the list of people who rescued Jews from the Nazis. In other words, as in virtually every successful occupation in history, some sections of the state apparatus and the wider civil society consciously collaborated with the occupying forces, while other sections actively resisted. Moreover, it is not sufficient simply to attribute these events in Polish history to foreign control from Berlin or Moscow. As well as the obvious point that anti-Semitic and other ethno-nationalist beliefs existed in Poland prior to World War II, such an attribution fails to ask why sections of the Polish state and civil society were willing to collaborate with occupying powers in the first place. In other words, the Polish officers and civilians who took part in these horrific deeds were more than just the inanimate puppets of the Nazis or the Stalinists. One has to consider the broader socio-political and cultural processes that made a significant number of Poles receptive to German and Soviet calls for lethal violence against the Jewish population. The prohibition against attributing any responsibility for the Holocaust to the Polish state or nation seeks to revere the many genuinely heroic acts that Poles committed during the occupation and to valorise the modern Polish nation by way of shared heritage. It aims to represent the courageous aspects of Polish history as the ‘true’ account and to shield this mythologised image of Poland’s past against the darker elements, including those that surfaced during the Holocaust. In other words, the Polish government seeks to legitimise current nationalism through selective history. It is a battle for Poland’s present on the terrain of Poland’s past. It is a battle for Poland’s present on the terrain of Poland’s past. Today in Poland, xenophobic suspicion towards refugees has manifested in mass, far-right demonstrations, such as the 60,000-strong march through Warsaw last November, which heavily featured the slogan ‘Pure Poland, White Poland’. Similarly, anti-Semitism has risen, with the Centre for Research on Prejudice estimating that 25% of Poles believe that Jews kidnap Christian children and that 43% of Poles believe that Jews ‘strive to the rule the world’. In Gdańsk and other major Polish cities, there are shops where one can readily purchase t-shirts emblazoned with such disturbingly nationalist imagery as a hammer and sickle over a Star of David. Naturally, none of this should be taken as an indication that all or even most Poles are raging ultra-nationalists, and it remains true that xenophobic and anti-Semitic views are difficult to gauge, even with survey data. Nevertheless, it is safe to say that there is a growing climate of suspicion and hostility towards those viewed as outsiders to the predominantly white and Catholic nation, which has helped the most fervent strains of nationalism become more acceptable in the political mainstream. In other words, the rise of ultra-nationalists who openly display their bigotry cannot be divorced from the much broader current of reactionary beliefs in Polish society. Here lies the true danger in the new prohibition. By refusing to confront and understand the social and political conditions that allowed ethno-nationalist sentiments to manifest horrifically in the past, including as collusion with the Nazi occupation, Poland risks permitting such ethno-nationalist sentiments to flourish today in similarly ghastly ways. In short, it is a danger of failing to learn from history when we need those lessons most. The great tragedy in all this is that Poland can easily claim an authentically rich tradition of brave and inspirational opposition to authoritarian rule without airbrushing the less savoury aspects of its past. From the Warsaw Uprising against the German occupying forces in 1944, to the Poznań protests against the Moscow-aligned government in June 1956. From the student revolts of March 1968, inspired in part by the revolutionary writings of Jacek Kuroń and Karol Modzelewski, to the Gdańsk shipyard strike of 1980, where Solidarność demonstrated the true power of independent trade union organising in the face of Stalinist repression. By passing the 2018 amendment to the National Remembrance Act, the Polish government has blown a chilling dog-whistle to the nationalists and we have only begun to see its consequences.